Gingeras, Alison M. "Instant Classic: Alex M. Gingeras on Jeff Koons." ARTFORUM, September 2013. Swanson, Carl. "Jeff Koons Is the Most Successful American Artist Since Warhol. So What’s the Art World Got Against Him?" New York Magazine, 13 May 2013, illustrated (ed. 1, in production). "Jeff Koons opens at Gagosian AND Zwirner this week." Phaidon, May 2013. Saltz, Jerry. "Jeff Koons: Gazing Ball." New York Magazine, May 2013, illustrated (Gazing Ball (Antinous), ed. 1). Smith, Roberta. "Gladitorial Combat: The Battle of the Big." New York Times, 16 May 2013, illustrated (Gazing Ball (Ariadne), ed. 1). Russeth, Andrew. " 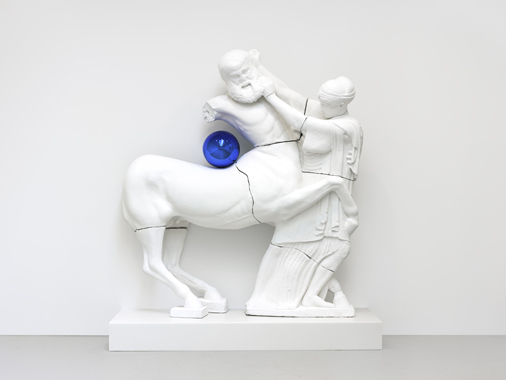 'Jeff Koons: New Paintings and Sculpture' at Gagosian Gallery and 'Jeff Koons: Gazing Ball' at David Zwirner." Gallerist NY, 14 May 2013. Halle, Howard. "Jeff Koons: Gazing Ball." Time Out-New York, May 2013. David Zwirner. Jeff Koons: Gazing Ball. Exh. cat., New York, 2013, p. 48-52, illustrated in color (prototype).